Published by McFarland & Co Inc, North Carolina. Price £49.95, 1994, 395 pages. Van Waterford is the penname of William F Wannoy who was taken POW in the former Dutch East Indies as a 16 years old boy, and was on the Junyo Maru when it was sunk by an American submarine on 18 September 1944 with the loss of 5640 lives, mostly Javanese conscript labour. This was the largest maritime disaster in world history. This book is intended for scholars, researchers and librarians who are looking for basic information on this subject in one volume. It is in two parts. 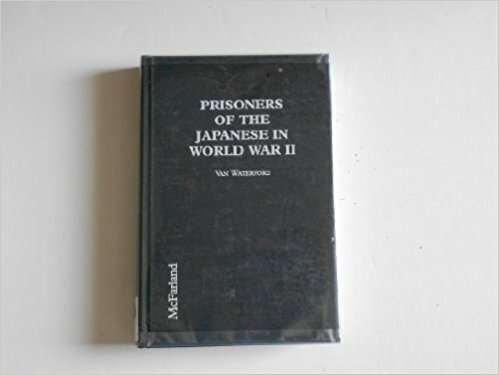 The first is a wide ranging review of many aspects of the life and treatment of POWs: Japanese military history and culture, life and routine in a POW camp, the psychological and medical aspects of imprisonment , war crimes, and conscript native labour. For American readers there is a chapter on the US National Historic Site and Museum, and their POW medal. The second and certainly the most interesting part is a list and description of all the camps, large and small, used by the Japanese to hold POWs, both military and civilian, throughout the Far East, and the ships used to transport them. The description of most of the camps is limited to their size, the numbers and nationalities held in them, and the work to which POWs were put. Facts about ships include the numbers and nationalities of POWs transported in them and the dates and routes they travelled. The numbers of men and women who died aboard ship, or when a ship was sunk is recorded, and makes grim reading. Many personal accounts by POWs are included. This mass of facts is well documented, and the many quoted sources are a valuable secondary source of reference. Van Waterford has obviously had to trawl an enormous number of private and public papers, books and diaries to assemble so much information in a single readable volume; in doing so he has produced a standard reference on this subject.